Double bill of Disney animated features following an arcade game villain. In 'Wreck-it Ralph' (2012), after 30 years of demolishing buildings in a popular video game, Ralph (voice of John C.
Reilly) longs to feel what it's like to be a good guy. He takes off on a journey which leads him on a path through the gaming world, but in his attempt to be a hero he unwittingly releases a threatening enemy, putting all of the arcade in danger. With the help of young racer Vanellope von Schweetz (Sarah Silverman), can Ralph repair the damage he has caused and learn how to save the day? 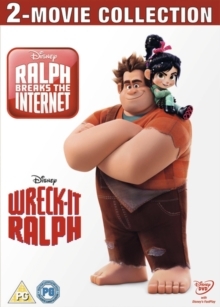 In the sequel 'Ralph Breaks the Internet' (2018) Vanellope's 'Sugar Rush' game is unplugged and Ralph decides the best way to fix it is to use the arcade's new Internet connection to go in search of the part they need.